Travel always exhausts me. So, when I had a chance to break up my trip from Maryland to Las Vegas to Los Angeles to Narita to Bangkok to Chiang Mai courtesy of some weird overnight stop over in LA, I jumped at spending the night in luxury. After flying across the country to Las Vegas, having drinks in Vegas with Abby (one of my favorite people in the world) and then hopping on another plane to LA, the tired seeping into my body is undeniable. Thankfully, as soon as I pull up to the Hotel Wilshire, previously a medical center, some of that washes away as my eyes light up at the hip facade in front of me. It just looks so … sleek. The tiny lobby of the hotel doesn’t do the property justice. It only teases with slick modern furniture and some art installations. Fortunately, as soon as I walk into my deluxe room, I am entirely satisfied. There’s a gorgeous bathroom with a shower that makes my mouth water — especially after my somewhat inadequate bathroom experiences in SE Asia (minus the Grand Mirage). And, although the room isn’t that big, as soon as fling myself onto the bed, I am utterly happy. Plus, there is a fluffy bathrobe to wear. I decide quickly that little soft piece of goodness will be what I sleep in this evening. The mattress is marshmallow soft, and the pillows … mmm … the pillows cave to my head and let me sink into another world. A world that I know will grant me a decadent sleep before a major trip across the Pacific. But, first I have to head upstairs to The Roof on Wilshire. I sadly remove myself from the soft comfort of the bed, thrown on shoes and head up to the top of the hotel for dinner. It’s night time and on this gorgeous deck with a pool and fire pits, the lights of LA twinkle and glitter on all sides. I breathe in the balmy air before I take a seat at a table with overstuffed cushions. Other than the mass amounts of hipsters hanging out around fire pits and clogging my view of the city, it is beautiful. I can see why this is one of the hotter spots to go in LA for a pool scene. By day, I can only imagine what incognito celebrities would hang out here, donning their designer swimsuits and wide-brimmed hats. For me, it is a perfect way to finish up my day of travel. Over dinner and drinks with a friend, we soak up the evening. I’m a bit of a dining snob after spending time in Las Vegas and working in the restaurant industry, so when I learn Eric Greenspan, Food Network’s Iron Chef 2010, is at the helms of the restaurant, I can feel the drool form. Considered California/French food, my friend and I order little snacks to try — the fresh tuna Nori Nachos, a big bowl of greens (Wilshire Salad), and an apple tart for dessert. The food is pretty good, minus the dessert, which is disappointingly bland and not worth the calories. And the wine the server recommends from Ojai to pair with our meal is smooth but probably not the best one to go with the food we chose. But still … not a bad dining experience. Then, it is back down to bed. As I slip between the plush Italian Frette bedding and snuggle into my pillows, sleep takes over and I am treated to a decadent night of peace before I head back out into the travel world. Sadly, since I stayed there the property became a part of the Kimpton brand. I was a few weeks too early for many of the signature Kimpton goodies, like the nightly wine hour, bike rentals and morning coffee (I was up far too early). So, next time I head there, I have to spend a little more time enjoying the amenities and a little less time sleeping. I did love the free and super speedy wifi. Getting there: From LAX, you will need to either rent a car or take a cab. Located on Wilshire Blvd. straddling Hollywood and Beverly Hills, the cab costs about $50. 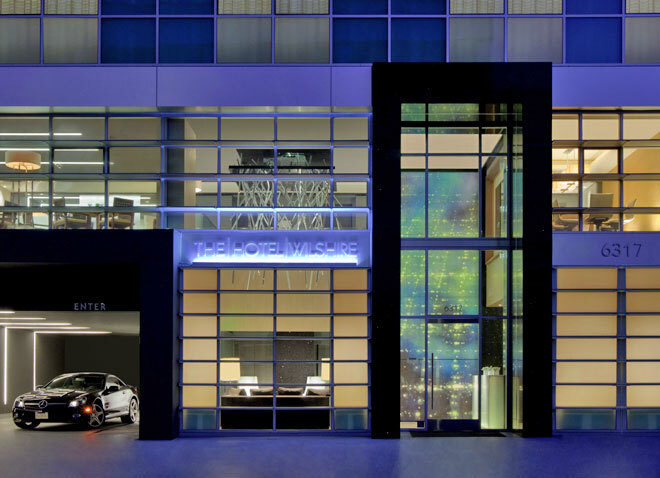 The bottom line: The 74-room LEED-certified hotel (one of only two LEED-certified under the Kimpton brand) is a nice respite from the mad dash of the city surrounding me. 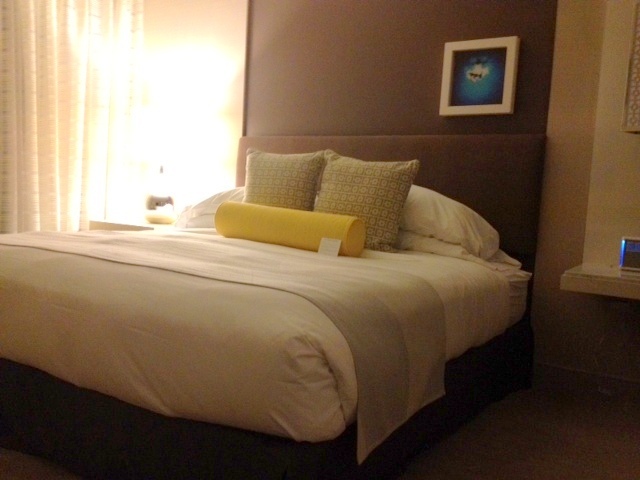 The room is on the small side, but the creature comforts — like the delicious bed — are fantastic. 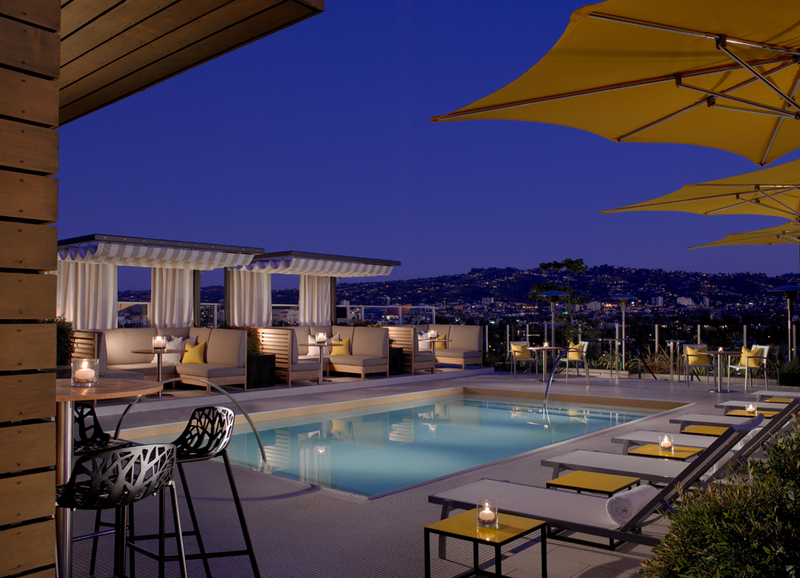 The Rooftop on Wilshire is trendy and I can see why people flock to it — the view is spectacular. It would have been nice to see a more diverse crowd there, but it is still a cool scene. Bonus — it isn’t far from LAX and when you’ve got a flight to catch, even in traffic, you won’t have to leave hours before your flight. Editor’s Note: My time stay was courtesy of Hotel Wilshire, however all opinions are my own. If you have questions regarding this, please read my disclosure policy. Doesn’t it?!? I will have to go back there next time I am in LA just to take a dip with a killer view.